Tired of spending all day, and many before, in the kitchen for Thanksgiving, so you are too tired to really enjoy it. Why not break out with somthing simple, yet decadent, stunning and delish! This was inspired when Chef Brad Farmerie of Public Restaurant in New York and The Thomas in Napa same on our show, Slow Living Radio, and brought his local family. My two favorite tastings from this show, the Cowgirl Red Hawk Triple Creme, with a wonderful rich pungency and a gorgeous rind! Smooth like the Failla Chardonnay, which has a beguiling flintiness balanced by fresh citrus and soft jasmine. 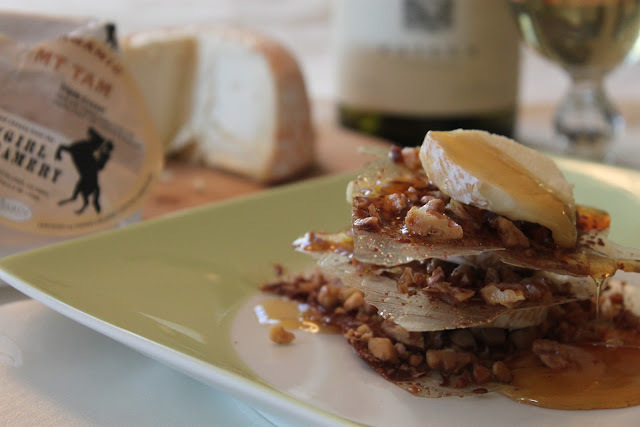 A wonderful combination to compliment the cheese, so I added a Mille Feuille with walnuts, the nuts helping to bridge the wine and cheese with their toasty complexity. I like to use spring roll wraps as their resulting transparency and fragile crispness are quite stunning. You could also use won ton wrappers of filo. Preheat oven to 350 degrees F and line a baking tray with parchment. Brush a spring roll wrapper with olive oil and cover with a thin layer of walnuts. Sprinkle with sugar to taste (not too much or it may burn). Repeat with as many as you like as they will keep, sealed in a cool cupboard for several weeks. Transfer to baking tray and bake for 5-6 minutes or until golden brown. Don't forget as they burn easily. Carefully lift onto a wire rack and cool. Break into desired sized pieces. Just before serving, slice cheese thinly and warm honey in a dish set over hot water until runny. Place one piece of walnut cracker on a plate, top with a slice of cheese and a light drizzle of honey to melt the cheese. Repeat to as high a mound as you like, topping with cheese and final drizzle of honey. Enjoy the interplay of textures - crisp, soft, gooey, crunchy and silky wine!